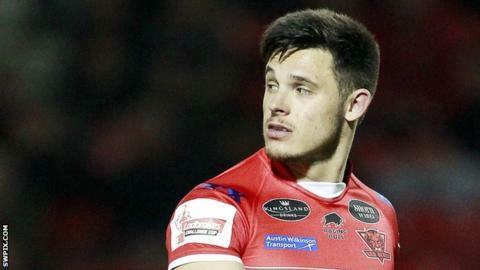 Niall Evalds' hat-trick guided Salford to a seventh-straight victory, beating Warrington to keep up pressure on Super League leaders Castleford. Jake Bibby, Evalds and Junior Sa'u twice crossed in a dominant first half for the Red Devils, with Brad Dwyer's dart from dummy-half the sole reply. Evalds completed his treble with two more second-half scores, before Tom Lineham grabbed a second for Wire. Kriss Brining dotted down late on to delight the travelling Salford support. Wire coach Tony Smith was subject of a apparent social media hoax after the game, with a post on the club's official Facebook page suggesting the Australian had resigned following the defeat. However, he attended the press conference as usual and the club confirmed there is an investigation underway as to how the post was published. Despite racking up 12 wins from 16 games, Salford have somewhat gone 'under the radar' but their success will be increasingly difficult to ignore as the season edges closer to the Super 8s. Guided around the field by Robert Lui and former Dally M winner Todd Carney on the back of a dominant pack, Ian Watson's side completely dictated the rhythm of the game and scored some spectacular tries in the process. Last year's runners-up Warrington were among the early season favourites for a return to Old Trafford but find themselves desperately clinging onto a top-eight spot after their ninth loss of the season. They had led a revival with only two losses in 10, but have now conceded 78 points in two games after defeats by Leeds and now Salford. "As unpleasant as it is, I don't give in easily. I'm just disappointed with the way we're playing. It's not about how I feel. We're hurting. It's been a tough couple of days for us. "We had different half-backs again. We haven't got that continuity. We were also playing against a team playing with confidence and executing well. We've got to tough it out and work hard." "That was a big one for us. It's a great result. It's about six years since we last won here and we've done the double as well. It will be a long time since that happened in Salford's history. "We're doing great at the moment but we won't get carried away. We know where we want to be and what we want to achieve but we'll take every week as it comes. "Todd Carney was outstanding, Jake Bibby and Josh Wood were good. We made some changes and that gave us real energy and enthusiasm." Warrington: Ratchford; Russell, Hughes, Atkins, Lineham; Brown, Patton; Hill, Clark, Cooper, Jullien, Philbin, Westerman. Replacements: Sims, Dwyer, G. King, Savelio. Salford: O'Brien; Evalds, Sa'u, Bibby, Johnson; Lui, T Carney; Tasi, Brinning, Hasson, Hauraki, Murdoch-Masila, Flanagan. Replacements: Kopczak, Wood, Krasniqi, Murray.